What is a Planning Unit Development (PUD)? A Planned Unit Development (PUD) is a zoning designation used to ease the strict application of a zoning ordinance in exchange for creativity in development. A PUD is often used to provide deviations from standards such as setbacks, height, density, uses, and other regulations. A PUD is used when planning for larger areas (one acre or more), planning for multiple contiguous sites, or accommodating multiple buildings on one site. The area should be under unified ownership at the time of a land use application for a PUD. In exchange for deviations from the zoning requirements, benefits such as additional greenspace, pedestrian or transit amenities, enhanced energy efficiency or stormwater management, affordable housing, mixed use, or enhanced architectural features are usually provided by the developer to achieve a higher quality development that might not otherwise occur. A PUD is used to implement development goals identified in a community’s comprehensive plan. 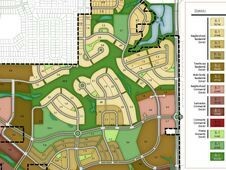 PUD process is not just an alternative to variances – it should be considered for unique development projects where the public benefit or development goal is clearly understood, and when the project would not otherwise be permitted through strict application of the zoning ordinance. When developing a PUD ordinance, be sure to identify amenities or conditions that will help achieve the goals and objectives of the community’s comprehensive plan. A PUD ordinance should only be used if these amenities or conditions are offered by the developer. You may want to specifically list in the ordinance which specific zoning standards were deviated from. A PUD designation is a similar process to rezoning. Think of each PUD as a customized zoning district that specifically identifies the location of buildings, uses, architectural design, etc. A PUD is a great tool for encouraging creativity and providing flexibility from the zoning ordinance, but once it is adopted any future change could require an amendment, depending on whether it is a major or minor change. A minor change can be approved administratively, while a major change would need to follow the same process as a rezoning. The community’s ordinance should identify which changes are considered minor or major.